War is a terrible thing, and the First World War was one of the worst, not the easy-to-define good guys/bad guys war, but the result of a complicated escalation of events, skirmishs and alliances built up over decades. None of that mattered when the victorious nations gathered in Versailles for the Paris Peace Conference in 1919 to decide the fate of the ‘loser’, Germany. Vengeful nations who lost hundreds of thousands of its soldiers and civilians came after the Germans looking for monetary and territorial compensation. This National Film Board documentary tells the story of these crucial six months of negotiations between the world’s powers, which by lack of foresight and stubbornness resulted in an even more destructive war 20 years later. It’s an intriguing period of 20th century history, a time which saw the borders of Europe, the Middle East and African redrawn, which directly affects many of the wars still fought today. And so it's this importance which magnifies the disappointment with this film. Inspired by the acclaimed novel by Margaret McMillan, Director Paul Cowan has delivered a decent and informative television documentary, something if I was flpping through TV channels and saw on the History Channel, I’d say, this is a pretty good doc. But as a premiere at one of the world's most prestigious documentary film festivals, it contains little cinematic power and leaves much to be desired. 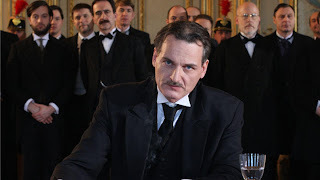 The style feels antiquated, a humdrum mixture of archival footage, straight-ahead recreations with actors dramatically playing the parts of Georges Clemenceau, Lloyd George and Woodrow Wilson et al. The narration by veteran Canadian actor R.H. Thompson is a dignified choice, but in Canada, his voice is so familiar, we're reminded us of the days of the dreaded “Heritage Minutes” (an inside reference to Canadians only, sorry). As a result, the film feels as out of date as the bushy moustaches worn by its characters. But it’s not all style which Cowan misses, there’s much time spent on the stubbornness and frustration of the big four world leaders (France, Italy, U.S., Britain) as to the degree of reparations owed by the Germans, and very little time spent on the individual stories in the conference. The redrawing of the world map which resulted in some of the most heinous conflicts the world has ever seen is given little screen time. The creation of Iraq for instance is only a passing glance, and nothing is mentioned of the Israel/Palestine negotiations. We expect something larger than life from the theatrical experience, and competence is not what we expect from a $12 ticket and a 'round the block lineup - a shame this film couldn't be made into something glorious like "The Fog of War".